Recently Facebook changed the algorithm for seeing brand page posts in your newsfeed. Lots of brands and page managers were bothered by this. Recently there have been a few articles (here and here) about how brands need to stop complaining the changes. I don't agree and here is why. I CHOSE to follow Starbucks, smart USA and Martha Stewart pages on Facebook because I wanted to see their posts. I rarely see posts from them now. Funny pictures from Smart, recipes from Martha, specials deals from Starbucks. But because of the change of the newsfeed algorithm, brands have to buy ads to get seen by eyeballs on Facebook. And they are targeting ads to people that aren't following them. So now my newsfeed is populated by ads from brands I HAVE NOT chosen to follow. 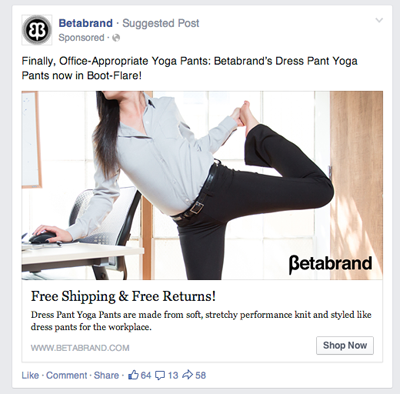 Hello office dress yoga pants ad! Anyone else see that one?! I would rather see posts from brands that I like and choose to see rather than paid ads. What do you think? Does this make sense? I wonder how this will pan out. 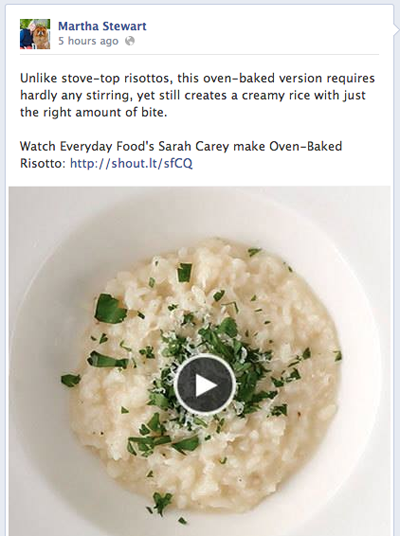 A post I would like to see from Martha... a delicious risotto recipe. 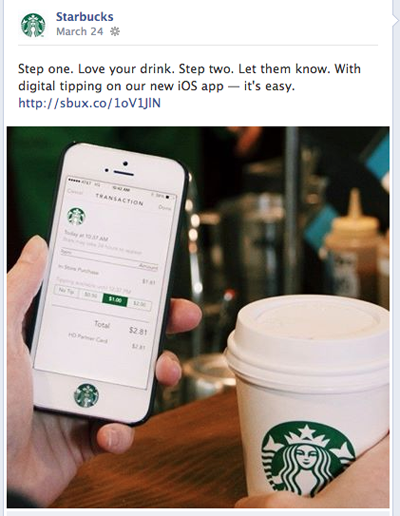 Oh and now you can leave a tip using the Starbucks app? I would like to learn about that in my Facebook newsfeed. This is what I see... ridiculous! Someone on Facebook said he didn't mind the changes because he clicks on the "Pages Feed" to see the pages he follows. I doubt many people know about this however and even if they do, it's an extra step. We all know how people feel about taking an extra step. They don't. I checked out the "Pages Feed" and it is very strange. It has an odd layout and was randomnly showing me items some of which were quite old. Not working for. Additonally, I did not see this option on the mobile app which we all know a growing number of people are using to access Facebook.